Driveway is not just a place in your house where your cars are placed but mostly it’s open and also the entrance of the house. People judge your lifestyle from the way you keep your living space. If its messy, it creates a negative impression & at the same time, a clean and spotless driveway will give curb appeal to every eye that spectate it. People who want to get rid of all kind of flaws in their entrance property finds it quite agitating to clean the driveway. You either have to call professional cleaners or spend the entire day in the cleaning process. Well, for a professional service, you have to spend a lot of money, every time when you book a cleaner. This can be troublesome for some people. But the spots and stains are so much that you cannot let go of the driveway to stay in the way that it is at the moment. There are spot marks of leaked oil or the impression of leaves falling on the ground that can leave stubborn marks on the driveway. 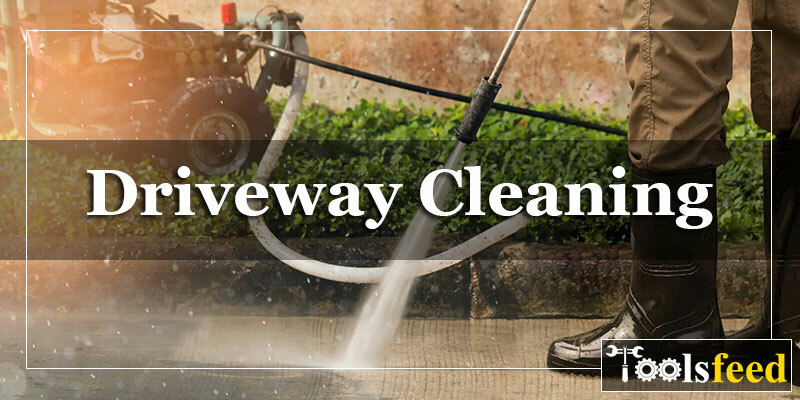 But, with some essential supplies and efforts, you can get sparkling clean driveway. If you follow the right process, you can save so much money that you usually give to the cleaners. Whatever imperfections your driveway has can be removed with the right cleaning techniques. There are various oils that can get released from the bottom of a car, causing stubborn looks on the driveway concrete. The motor oil, gasoline, or brake fluid are commonly visible on the ground unlike the asphalt that is in black color and hides the stains. Remember, all these leaks can cause serious stains on the driveway. And the only solution is to clean them rapidly, more like as soon as it gets spilled or you notice it. These auto-related oils can also interact with asphalt’s petroleum base so that it further wanes and softens. For any kind of surface, first you should soak up the spill with a kitty litter or any other absorbent product. First you should leave it there for few hours so that most of the liquid material is absorbed. After that, simply scoop up the little and swipe the portion of the ground. In order to remove the remaining litter, you can use one of the following cleaning methods for different materials. Asphalt Follow-Up: Once the excessive spill is absorbed, you should then spray some biodegradable oven cleaner on the target area. You should ensure that the liquid used is biodegradable in nature. Simply allow the liquid to rest for 30 minutes and then rinse it. You can use the garden hose for the rinsing purpose. Just the way the oven cleaner dissolves the most stringent grease in the microwave, similarly, it will break down the excessive oil from the ground. Concrete Follow Up: Concrete is also one of those surfaces that let the oil get inside the tiny holes in the material. The ideal way to take out the excessive spill from the concrete is to dissolve the oil and then draw it outside. For this, you should mix enough of a powered moisture-absorbent product which can be corn starch as well in liquid TPS and create a paste. Now, spread it all over the target area and work it inside the concreate with a nylon brush. Spread an even layer and let it sit on the ground for around 30 minutes. You can use a putty knife to take out the dried paste. It will bring along the excessive oil from the concrete. Then, you can simply rinse the area using a garden hose or power washer. If the stains are fresh then you probably have to make single attempt while old stains may require multiple attempts. During winter snow, you cannot possibly avoid or escape the tracking mud and dirt on your tires that is evidently visible on the driveway. The fresh mud is easy to remove but as soon as it dries, it become more challenging to get rid of it. With a power washer, it won’t give you as much trouble but if you don’t have that then the cleaning essentials are stiff-bristle push broom and a garden hose. Well, the driveway dirt removal techniques work equally fine with both different equipment for different surfaces. First you have to sweep away the loose dirt and debris from the driveway and then use dampen caked-on mud can be removed. You should let the water work its magic and soften the mud before you use the push broom to clear it away. The time of cleaning will depend on how much mess is there in your driveway. But in any case, you will have to use a lot of water to clean. After autumn, you will always find a rake of mess piled up on your driveway. It could be fallen leaves, piles of mulch, pine needles, and so on that can leave tacky looking brown stains on the ground. They mostly appear on the concrete as it is lighter in colour. As soon as the decomposing begin, the leaves release tannin which is a colourful by-product of natural decaying process. As you clean the driveway, you should release the colouration from the ground. You can start by sweeping the concrete surface and then spray the stained area with garden hose to rinse away the dirt. To make the cleansing agent, you should take a large bucket and fill it with 3 gallons of hot water. Now, add half a cup of liquid dish wash. For better results, you can also use powder detergents that are ideal for removing food stains. Now, after slowly spreading the mixture on the ground, simply cleanse it with a stiff-bristle nylon brush. Scrub the area thoroughly and take out all the marks. Now, you can rinse the area using a garden hose. As the ground will get uncovered from the soap lather, sparkling new ground will get the visibility. If you still witness the marks then you can repeat the process, else simply wipe the floor and set it dry. Paint can be a serious issue for anyone who has been doing any sort of painting outdoors. This is especially the case when you use wood paint to paint the furniture of the house. The cleaning will be equally complex in case of asphalt and concrete both. For latex based paint spills, you can easily get rid of them by wetting the splatter with water, sparkling on household scouring powder and scrubbing the floor with nylon brush. Rinsing have to be done at the end and set the floor dry to avoid watermarks. Oil and acrylic based paints splatters are difficult to remove. People that has asphalt driveways, the can simply coat the area with asphalt sealer. This way the area will be renewed and it will also cover the splatters. Basically, no solvents that are used in concrete surfaces must be avoided on asphalt surface because such solvents can seriously damage the surface. You can start by pouring the solution on the splatters and then use a natural bristle brush to scrub away the paint. The time is mentioned on the spray bottle and you should leave the solution on the oiled surface for the stated time. You should ensure that the product is environment safe. Rust stains are not very visible on asphalt driveways but they cause a lot of trouble for the concrete driveway owners. Rusting work so quickly that even if you have left the paint can outside on the driveway and the rain strikes, you will find a dark brown circle imprinted on the ground. That is how quickly the rust appears on the ground. But, for instant removal, you can use muriatic acid. It has got harsh properties and must be used with utmost care. For example, before using the acid, you must wear the rubber gloves and protective eyewear glasses so that the harmful fumes coming out of the acid do not affect your eyes. In order to use it, simply add some water to the acid and form a liquid. The proportion should be ¼ cup of acid to a bucket with 2 cups of cold water. This will minimize the risk of splashes. If somehow you splash the mixture on your body, you are insisted to immediately rinse it off because the skin begin to rash or agitate. Pour the entire mix to the rust stains carefully and slowly and scrub it in the traditional manner with a nylon bristle brush. Now, let the solution sit on the stain for some time so that it can loosen up the rusting. After a certain amount of time, simply put some water on the material using a garden hose. If you still see the rust marks appearing on the ground then repeat the treatment 2-3 times.